No shuttles, remote parking lots or long walks while trying to balance the kids' gear on your shoulder. Sit down to pancakes, omelets and all those other favorites you don't normally take the time to make at home. Gather fireside for games or a movie marathon. The Town Lift is right outside, an easy walk even for the little ones. Stroll historic Main Street, browsing boutiques and peeking inside galleries. The area has 426 downhill trails to conquer. Hop the nearby Town Ski Lift and get started. 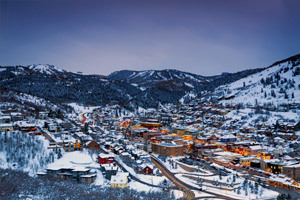 Park City's first luxury vacation residence with true ski-in/ski-out access. Enjoy. You're just about a mile from Park City's vibrant, historic Main Street. Grab backpacks, water bottles, binoculars and cameras, and hit the Round Valley trails, a little over 3 miles away. Round up a foursome (or at the very least a twosome) and hit the course at Park City Golf Club. Park City’s first true ski-in/ski-out luxury vacation residence, The Caledonian is ideally situated right on historic Main Street. Not only are you slopeside, but you’re also in the heart of the shopping, dining and festival action. Browse the boutiques, gallery hop and take a sneak peek at dining menus until you narrow it down to the final contenders. Be thee warned – choosing a winner won’t be easy, especially considering the convenience of Butcher’s Chop House right onsite. (Once you’ve all thawed out from a day on the slopes, you may not be able to convince your crew to bundle back up again.) Be sure to check the concert calendar for The Cabin Park City – it’s right around the corner. Or keep it low-key and gather your crew around your dining table for late-night drinks and snacks and a few rounds of Spoons or Crazy Eights. If you’re thinking about skiing Deer Valley, the complimentary seasonal shuttle makes it super simple – just grab your gear and go. Spacious, upscale one- and two-bedroom condominiums range from 1,000 square feet on up, and select units come with a private hot tub. Even if you opt for the non-hot-tub model, you’ll still have an oversized jetted tub in the master bath to help you recover from your day on the mountain. Specialty finishes include custom hardwood floors, slate tile and Berber carpet – plus each residence has a gas fireplace and private balcony with Main Street or mountain views. There’s an in-unit washer/dryer, so it’s easy to toss in that favorite blankie that accidentally got dropped in the slush, or just keep all those base layers ready to roll. And the well appointed kitchen is chili-cookoff-ready, assuming you can find worthy opponent. Renowned for its skiing/snowboarding terrain, the Park City area is home to 426 downhill trails across 9,326 acres – which explains why the U.S. Ski and Snowboard team is headquartered here. Plus, you’re steps from the fascinating Park City Museum, and the Egyptian Theatre for concerts, comedies, musical theater and plays. Winter is jam-packed with snow sports, incredible dinners and amazing après ski small plates. In the summer season, Park City Golf Club is just over a mile away, and local mountain bike trails abound. Go hiking, fly fishing or join in on the water sports at nearby Jordanelle Reservoir. If you really want to be a hero, plan a surprise outing to Utah’s largest alpine coaster – reaching speeds up to 30mph over a mile of loops and hairpin curves. It’s just a half-mile away. Located between Deer Valley and Park City Mountain Resort. Host of the Sundance Film Festival. Home to Main Street, where you will find 50 restaurants and over 200 unique businesses.